With the two Koreas seeking to ease cross-border tensions following the inter-Korean summit last week, the South Korean Army’s mandatory military service is expected to be cut from 21 to 18 months before 2022 when President Moon Jae-in’s five-year term ends. According to the Ministry of National Defense, the military will submit such plans to Moon this month. On the campaign trail, Moon pledged to cut the period of military service and the number of troops. If the measures take effect, the Army will see its enlisted soldiers serve 18 months by 2022. In order to achieve the goal, the reduced service time should be applied starting with those joining the military in 2020, military officials said. Last July, Moon unveiled a five-year plan to scale back the mandatory military service period to 18 months from the current 21, along with a separate scheme to reduce the number of armed forces to about 500,000 from 620,000. Dubbed “Defense Reform 2.0” the scheme also calls for the military to modernize its defense structure tailored to meet North Korea’s asymmetric military threats such as ballistic missiles and nuclear weapons. The reduced service period is expected to affect those serving in other branches of the military, such as the Air Force and the Navy as well. 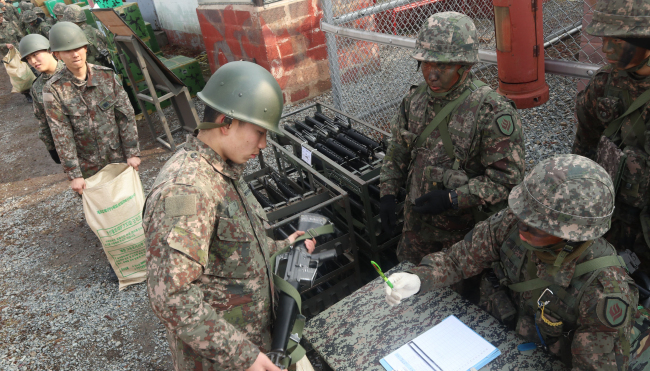 Currently, every able-bodied Korean man is required to serve in the military -- 21 months for the Army, 23 months for the Navy and 24 months for the Air Force. The draftees can also choose to serve in the police for 21 months and the fire department for 23 months.